After the breakaway of the day was caught, BORA – hansgrohe rider Maciej Bodnar went on attack and built up a one-minute gap with 45 km remaining. Shortly before the finish, the race went on fire as several riders attacked. 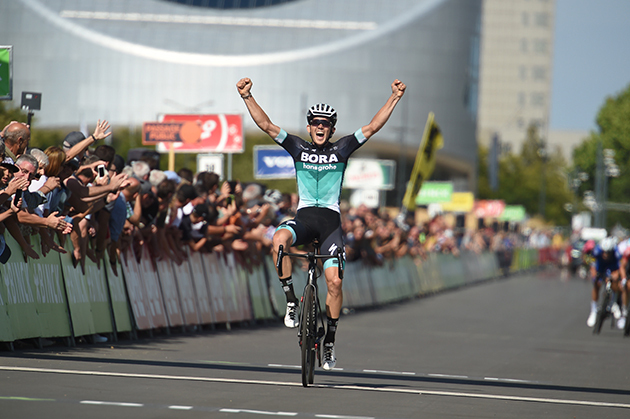 But it was BORA – hansgrohe rider Gregor Mühlberger, who surprised all by taking an impressive win in Sittard-Geleen, the first WorldTour victory in his career. The penultimate stage of the Binck Bank Tour was like a miniature Spring Classic race with some climbs familiar to those who had ridden the early season one-day races. The profile of this 182.2 km long stage listed no fewer than 13 ascents, the infamously short, sharp and steep climbs the Classics are known for. A tough profile that would tire out the riders and make contesting difficult. The team focused on their two riders Jay McCarthy and Gregor Mühlberger, both had already good results in similar races like the Ardennes Classics. Especially, Jay McCarthy was supposed to try and stay in front in the downhill section with 6 km to go. Four riders escaped and built today’s breakaway of the day with a gap of around four minutes. The peloton pulled hard and with 85 km to go the gap decreased to two minutes. Despite not feeling well, Daniel Oss, tried to support the team as well as possible, but unfortunately couldn’t finish the stage and had to abandon the race. The peloton had just closed the gap with 45 km remaining, when BORA – hansgrohe rider Maciej Bodnar launched an attack from the main field and pulled away with another opponent. After a few kilometres some other riders were able to join the new breakaway. But the reduced bunch increased the pace and several riders attacked out of the pack. With 5 km to go it was BORA – hansgrohe rider Gregor Mühlberger who made the final move and managed to open a gap. The Austrian flew to his first WorldTour victory and took an impressive stage win ahead of T. Wellens. Teammate Jay McCarthy took 9th place, and completed a successful day for BORA – hansgrohe. Due to illness, Lotto Soudal rider Tomasz Marczyński won’t be able to participate in the upcoming Vuelta a España. 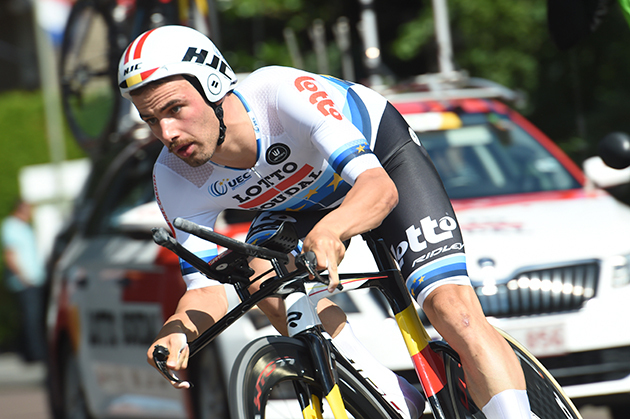 European time trial champion Victor Campenaerts will replace the Polish rider in the line-up. That way, eight Belgian Lotto Soudal riders will be at the start in Malaga on the 25th of August. EF Education First – Drapac p/b Cannondale is proud to welcome Moreno Hofland into the #PinkArgyle family in 2019. The 26-year-old has spent the duration of his career racing for Dutch and Belgian teams. 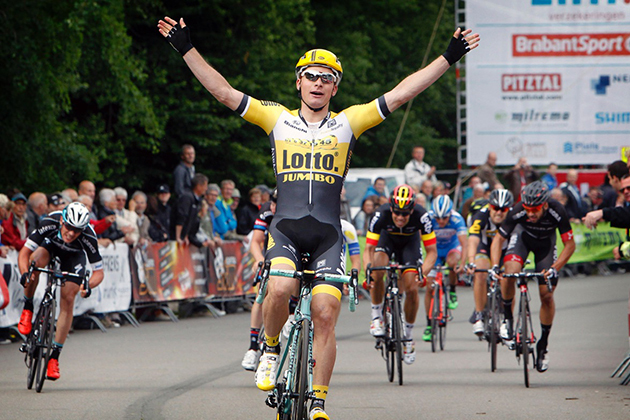 Moreno Hofland winning stage four of the 2015 Ster Toer. The 26-year-old has won two stages of the Tour of Utah, a stage at the Tour of Yorkshire and three stages and the overall at Tour of Hainan. Amongst his 13 victories, he considers a stage win at Paris-Nice in 2014 his proudest achievement. Hofland is eager to embrace the opportunistic style of racing on offer with EF Education First - Drapac p/b Cannondale. He anticipates playing a key domestique role during the Classics seasons and sitting on the back end of the #PinkArgyle sprint train in the scrappy, punchy sprints in which he's historically excelled. Cycling is a family sport for the Hoflands, who named their sons after cycling legends: Moreno and Fausto. Hofland’s younger brother – that’s Fausto – also raced in his teens. “I started with swimming, but in the end, when I was 14, it became boring to me,” said Hofland. “It was always the same thing in the pool. My dad is a cyclist, and he was still racing his bike then. I saw this every day. He took me one time to train at the local club, and I immediately fell in love. The sprinting, the chasing, the winning. It was so much fun. My brother got involved, too, and it became a thing to do together as a family. Now Hofland strives to be better than himself. 18 August, 2018, Santa Rosa, California (USA): Nathan Van Hooydonck is the latest rider to extend his contract with Continuum Sports in a move that will see the Belgian rider continue his classics mentorship with Greg Van Avermaet in 2019. General Manager Jim Ochowicz is excited to see Van Hooydonck continue his development as a rider, a pathway that began with BMC Development Team. "Nathan Van Hooydonck's progression with BMC Racing Team is a testament to the success of BMC Development Team so we are thrilled to extend Nathan's contract. Since Nathan turned professional mid-way through the 2017 season, he has shown great potential in the classics and with our focus on these races, Nathan will be able to learn from the best in the business, including Greg Van Avermaet," Ochowicz said. "Nathan has also proven to be a valuable teammate in stage races and when given his own opportunity he is able to make the most of it, as we saw this year at the Dubai Tour when he was fourth overall. We look forward to seeing Nathan make his Grand Tour debut in the near future and continue his progression as a rider." Van Hooydonck acknowledged the opportunity to learn from Van Avermaet as motivation to re-sign with Continuum Sports. "At this point in my career I need to help my leader in the best possible way. As a classics rider, I do a lot of races with Greg Van Avermaet and I knew if I went to a different team then I would have to help someone else. Greg and I really get along and I feel very loyal to him so at this time, I couldn't imagine riding for another leader. That was the main reason I decided to stay in the team," Van Hooydonck said. "I have always felt appreciated in the team and that is very important to me. I have a good relationship with my coach, Marco Pinotti, and the team is very professional and one at which I can best develop as a rider. I would like to end this season well and then in 2019, be there for my leaders to support them whenever they need me. If there is a chance to go for a nice result myself, I will take it on with both hands."